and which approximates the number of primes < x. 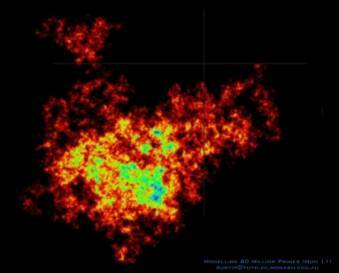 Similarly, it has nothing to do with the mathematician Xian-Jin Li who has reformulated the Riemann hypothesis. It is about an ancient Chinese concept called li and its possible relevance to our understanding of the distribution of primes. "I have practiced Chinese calligraphy for many years, and am not yet a master of the art, which could be described as dancing with brush and ink on absorbent paper. Because ink is mostly water, Chinese calligraphy - controlling the flow of water with the soft brush as distinct from the hard pen - requires that you go with the flow. If you hesitate, hold the brush too long in one place, or hurry, or try to correct what you have written, the blemishes are all too obvious. But if you write well there is at the same time the sensation that the work is happening on it own, that the brush is writing all by itself - as a river, by following the line of least resistance, makes elegant curves. The beauty of Chinese calligraphy is thus the same beauty which we recognize in moving water, in foam, spray, eddies, and waves, as well as in clouds, flames and weavings of smoke in sunlight. The Chinese call this kind of beauty the following of li, an ideogram which referred originally to the grain in jade and wood, and which Needham translates as "organic pattern," although it is more generally understood as the "reason" or "principle" of things. Li is the pattern of behaviour which comes about when one is in accord with the Tao, the watercourse of nature. The patterns of moving air are of the same character, and so the Chinese idea of elegance is expressed as feng-liu, the flowing of wind." "The tao is a certain kind of order, and this kind of order is not quite what we call order when we arrange everything geometrically in boxes, or in rows. That is a very crude kind of order, but when you look at a plant it is perfectly obvious that the plant has order. We recognize at once that it is not a mess, but it is not symmetrical and it is not geometrical looking. The plant looks like a Chinese drawing, because they appreciated this kind of non-symmetrical order so much that it became an integral aspect of their painting. In the Chinese language this is called li, and the character for li means the markings in jade. It also means the grain in wood and the fiber in muscle. We could say, too, that clouds have li, marble has li, the human body has li. We all recognize it, and the artist copies it whether he is a landscape painter, a portrait painter, an abstract painter, or a non-objective painter. They all are trying to express the essence of li. The interesting thing is, that although we all know what it is, there is no way of defining it. Because tao is the course, we can also call li the watercourse, and the patterns of li are also the patterns of flowing water. 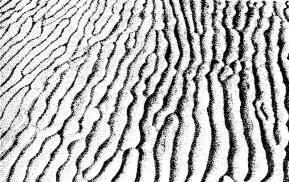 We see those patterns of flow memorialized, as it were, as sculpture in the grain in wood, which is the flow of sap, in marble, in bones, in muscles. All these things are patterned according to the basic principles of flow. In the patterns of flowing water you will find all kind of motifs from Chinese art, immediately recognizable, including the S-curve in the circle of yang-yin. The great tao flows everywhere, to the left and to the right, It loves and nourishes all things, but does not lord it over them." At the end of the 1990's, I was spontaneously struck by an extraordinary mental image – that of a 'dynamical history' underlying the familiar distribution of prime numbers. The mental image seemed to imply a sort of evolutionary process in which the prime numbers were seen to be moving particles in a 1-dimensional continuum, eventually coming to rest when they collectively achieved the dynanical equilibrium of their familiar configuration. In the following years, while attempting to write about certain (more widely acknowledged) mysteries associated with the prime numbers and Riemann zeta function, and in particular about the sort of aesthetic reactions people tend to have to them, I invoked the notion of li. As I then understood it, it was typified by the kind of beauty associated with mists, clouds, smoke, rugged mountain ranges, gnarled trees, etc. 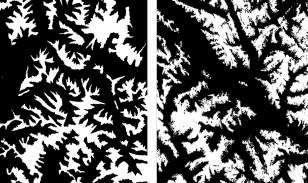 "Li are essentially dynamic formations, and as such can give the impression of a frozen moment, of a process caught at a particular instant of time..."
"The aesthetic appeal...owes much to...the impression they convey of frozen activity, which seems to present a snapshot of intense formative processes from the remote geological past." 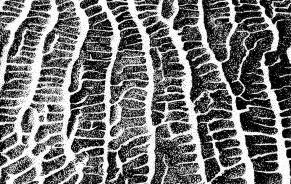 "...well-delineated boundaries [wherein] the topography is more strongly revealed, clearly exposing the imprint of the active formation processes involved ." The highlighted quotes above struck me as hugely relevant to my fleeting impressions concerning the primes, so I decided to put together this webpage dedicated to the 'Li-ness' of the distribution of primes, and of the (intimately related) Riemann zeta function. The seeming 'Li-ness' of the primes and zeta, is to me, another major piece of the 'prime number evolution' puzzle. This subtle, unquantifiable aspect of their appearance suggests that they have been (and I use the past tense very loosely here!) 'in motion'. That was the initial flash of insight. I didn't make the connection with li at the time - that came a couple of years later. And when I did, it was Alan Watts' description I had in mind. The characteristic of li which David Wade describes above hadn't occurred to me. "Li are appealing in a purely aesthetic sense because, although they tend to be relatively simple configurations, they have a high degree of content." 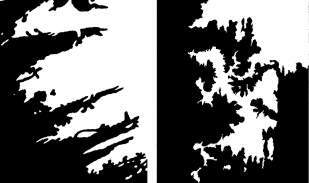 "In common with many li, the processes by which these forms come into being can sometimes be traced back to structures associated with their underlying causation, and sometimes not; the reasons for this are still mysterious. It is also the case that they may appear at every level of scale, from the micro- to the macroscopic, a fact that provides additional testimony to their essentially archetypal nature." "The aesthetic appeal that links each of these examples...derives from the attractive combination of geometry and pure chance." In his book Number Theory in Science and Communication, M. Schroeder argues that the distribution of primes, with its blend of structure and apparent randomness possess the necessary ingredients for aesthetic appeal. "derive from a natural and inescapable law of affairs and things that arise directly out of the nature of the universe." "Mathematics takes us still further from what is human, into the region of absolute necessity, to which not only the actual world, but every possible world must conform." 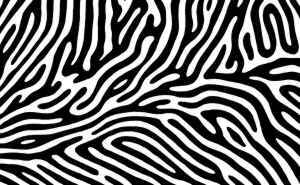 "...a curiously irregular cell structure that appears to vacillate between the various possible systems of orderly close packing. 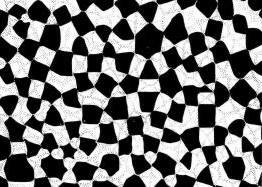 In fact, the appearance of such disturbances is the distinguishing mark of li; perfectly ordered arrays belong to the domain of pure symmetry." This description brings to mind the delicate balance between order and disorder evident in the distribution of primes. In the graph below, a vertical step occurs above each prime number along the horizontal axis. Note that the Greek letter π is being used in a different context than the familiar 3.14... which relates circumferences and diameters of circles. 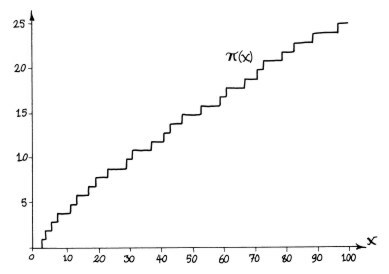 Here π(x) indicates the number of primes less than or equal to a given number x. The abiding characteristics of these formations, common to many li, is the sense of an overall order, showing clear repetitive features, but lacking a strict periodicity." The last sentence immediately brings to mind the Prime Number Theorem which tells us that the primes have an overall order (a tendency to 'thin out' at a predictable logarithmic rate), although they are well known to be lacking a strict periodicity. This image was reproduced from Prof. Marcus du Sautoy's Music of the Primes website, which ties in with his acclaimed book of the same title. 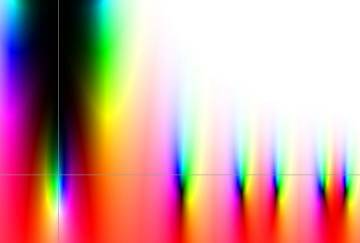 The image is not explained, but it has almost certainly been produced from the structure of the Riemann zeta function. Note that the colour scheme has been added later as an aesthetic touch and appears not to be mathematically relevant. 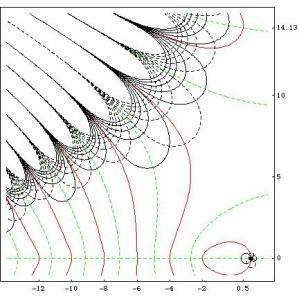 This is an old graphic from E. Weisstein's Mathworld generated from the modulus of the Riemann zeta function. 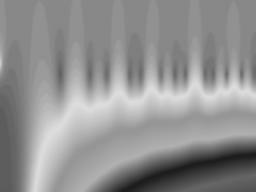 The spikes correspond to the nontrivial zeros, the irregularity of their spacing being particularly evident at this scale. 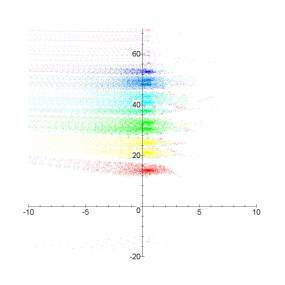 2-dimensional representations of the Riemann zeta function using colours, by Alex Astashyn who produced them using a Mathematica application developed by Bernd Thaller (University of Graz). 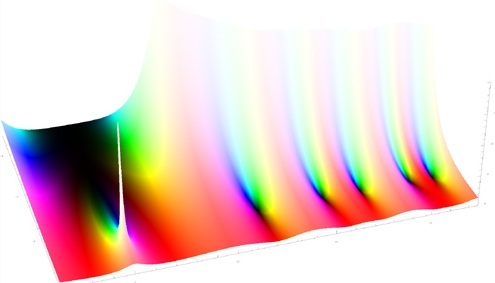 Here we see the result of the Riemann zeta function acting on various pieces of the critical line Re[s] = 1/2, the graphs coming from "Phase of the Riemann zeta function and the inverted harmonic oscillator" by R. Bhaduri, A. Khare and J. Law. 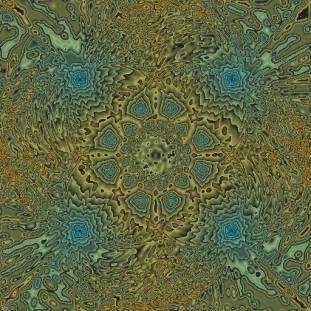 Here's another (seemingly fractal) prime-generated image from A. Leatherland. 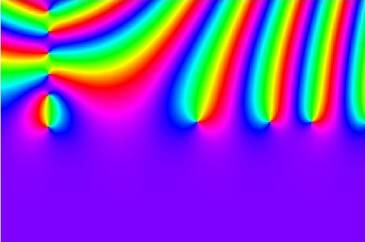 Another representation of part of the Riemann zeta function. 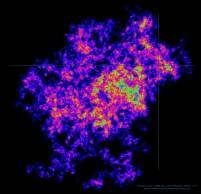 You should bear in mind that, as the complex plane extends infinitely in all directions, any graph of the zeta function which can be physically produced can never show more than an infinitesimal part of the zeta function's overall behaviour. Any 'li-ness' present is therefore only ever hinted at. According to Voronin's Universality Theorem the zeta function, if we look far enough, will replicate virtually any behaviour of any part of any analytic function, to arbitrary accuracy, infinitely often! Woon has deduced from this that the zeta function is in some sense a fractal object. 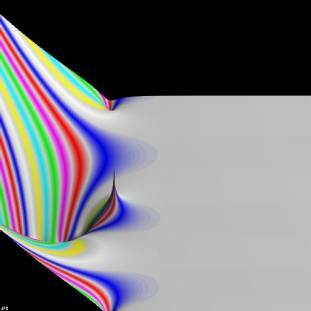 Another window on the Riemann zeta function (origin unknown). 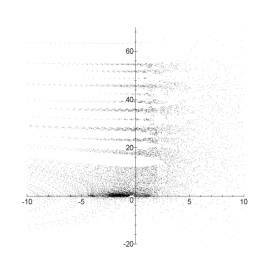 This animation shows the way in which the exact distribution of primes, as represented by the function π(x), can be constructed from a simple function plus a succession of sinusoidal functions (waveforms) whose frequencies are directly related to the roots of the Riemann zeta function. It is fully explained here. "With the formation of the river systems there is a certain paradox of priority; rivers shape the landscape, and the landscape contains the river. But, like the chicken and egg riddle, it is unclear which came first. There is, in fact, a distinct sense of the inevitability of such forms, a view that if carried through credits them with the almost Platonic noumenon of preexistence."